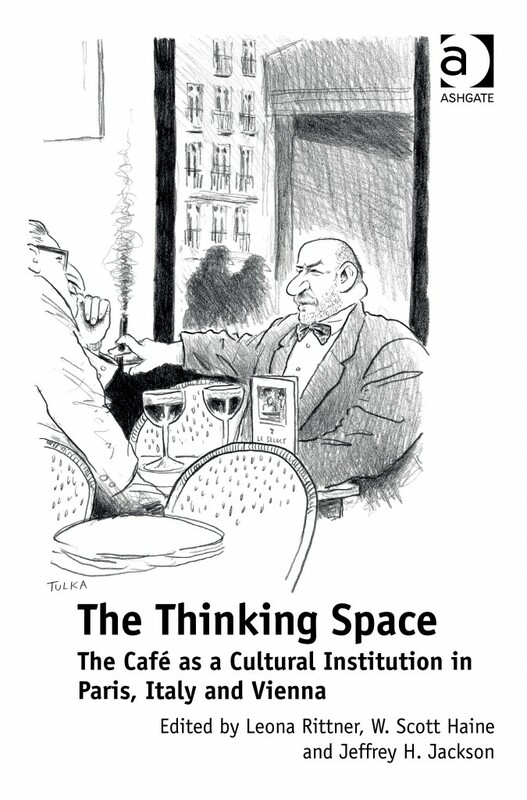 Excerpt from The Thinking Space: The Café as a Cultural Institution in Paris, Italy and Vienna. Used by permission of the Publishers from ‘Introduction’, in The Thinking Space eds. Leona Rittner, W. Scott Haine and Jeffrey H. Jackson (Farnham: Ashgate, 2013), pp. 1–22. Copyright © 2013. All rights reserved. The cafe is not only a place to enjoy a cup of coffee, it is also a space—distinct from its urban environment—in which to reflect and take part in intellectual debate. Since the eighteenth century in Europe, intellectuals and artists have gathered in cafes to exchange ideas, inspirations and information that has driven the cultural agenda for Europe and the world. Without the café, would there have been a Karl Marx or a Jean-Paul Sartre? Subscribers, The Thinking Space: The Café as a Cultural Institution in Paris, Italy and Vienna. A $124.95 value. Free book giveaway to one subscriber ends September 15, 2015. Free Subscription: Join our thousands of followers to receive your copy of our Readers’ Choice: 253 Books About France, including books about Architecture, Interiors and Gardens; Arts; Biography; Children; Culture; Fashion; Food and Wine; Memoir; Mystery; Novel; Science; Travel; and War, along with email notifications of new posts on the website. Once subscribed, you will be eligible to win—no matter where you live worldwide—no matter how long you’ve been a subscriber. We never sell or share member information. (Part One) We now have a broad picture of the evolution of European intellectual cafés. This has been an easy task because there are many fine introductions and overviews on the subject that nevertheless often repeat the same material and sources. But can historians go deeper into the history of intellectual cafés? How did these places function? How did writers interact within these environments: with the owner, the staff, and the larger urban context surrounding the cafés? How did writers interact with each other and with other artists and intellectuals? How does the daily life of these cafés intersect with the great events across the period 1700 to 1950? These are the questions that this volume explores in order to move beyond broad generalizations to specific histories of particular cafés and the writers who frequented them. By delving more systematically—for example by exploring the evolution of the conversations of Impressionists or Surrealists in cafés—scholars can refine the nature of the interactions between social, intellectual, cultural, and gender history. In particular, by doing so historians can explore the interactions between sociability, solitude, and creativity because cafés were also a key terrain upon which public and private life interests lay. A model for future studies of this area is the collection of documents by the most representative figures of Viennese café life in its golden age around the turn of the twentieth century: Harold B. Segel’s The Viennese Coffeehouse Wits, 1890-1938. This 400-page anthology of writings by the major café authors during the cultural apogee of the city on the Danube at the heart of Central Europe is an invaluable primary source. One of the best sections of Segel’s valuable introduction to this collection of café writers discusses the “art of small forms” or “little art,” including short stories sketches, anecdotes, essays, reviews, feuilletons, and aphorisms. Segel includes a rich set of these from Karl Kraus, Peter Altenberg, Egon Friedell, Alfred Polgar, and Anton Kuh. But did not this art of capturing daily life from the vantage point of a table and bar start with Addison and Steele in seventeenth-century London or Baudelaire in nineteenth-century France? Edward J. Ahearn’s chapter, “A Café in the High Time of Haussmannization: Baudelaire’s Confrontation with the Eyes of the Poor,” makes a strong case for an affirmative answer to this question. What methods should be used to study these sorts of questions? Below I survey and interrelate a range of methods and disciplines that either implicitly or explicitly has helped guide the contributors to this book and other historians in the quest to understand the collective and individual creations of these spaces but that have never been fully developed before. I also provide some examples of how these methods can be applied to future studies not only of traditional intellectual cafés of the past few centuries but also of the new generations of writers, intellectuals, and artists and the emergent “knowledge workers” and “creative class” that assiduously use cafés around the world today in this new phase of globalization. What we shall discover is that many of the lessons and insights of the classic European intellectual cafés still apply to an increasingly digital world. Although the association of cafés and intellectual life goes back to the original cafés in the Muslim world, no philosopher or historian has yet developed a comprehensive theory explaining why writers have socialized and written in cafés. This should not come as a surprise since it is only recently that the role of cafés in social much less intellectual life has been explored. What this volume will explore are studies that theorize the functions, locations, interactions, expressions, and historicity of cultural creation in cafés. Oldenburg’s theory provides an excellent envelope in which to enclose Jürgen Habermas’s theory of the rise of the “public sphere.” From Oldenburg’s perspective the concept of the public sphere includes the political aspects of the third place. In his 1962 book on the subject Habermas drew heavily on German historians of the 1920s and 1940s who explored the history of seventeenth- and eighteenth-century British coffeehouses mentioned earlier. In the shadow of war and totalitarian regimes these historians argued that the early modern public sphere included discursive spaces such as cafés, libraries, and debating societies that also subscribed to or held newspapers and magazines. In these spaces the British “educated themselves,” gaining knowledge of public life and self-government. Habermas essentially references these earlier historians rather than providing any new evidence. But his brilliant theoretical framing of the issue and his connection with current problems of commercialization and de-politicization have made his study highly influential and a common reference point for many historians who now use the term public sphere, especially for the Enlightenment era. The librarian Benoît Lecoq—in an article on cafés in the influential Lieux de mémoire (Spaces of Memory) series edited by Pierre Nora exploring French memory and tradition—offers an interesting variation on this theme of the café in the public sphere. He suggests that cafés were an “intellectual laboratory” and notes that the café and the newspaper were born at roughly the same time and in the same places. Lecoq quotes a nineteenth-century writer on Parisian café life, Auguste Lepage, who in 1882 observed that writers went to cafés “to read newspapers, magazines, to write letters, see fellow writers, receive greetings, but rarely for fun.” Thus, Lecoq argues the café was a space of freedom and played a role analogous to that of a laboratory: a space to test ideas and outline theories which through discussion, banter, and disagreements produced new ideas and cemented friendships or caused disputes. The café’s function was thus like that of a talking magazine. As regards locating intellectual cafés in geographical space, the theories of Walter Benjamin are especially apt. Of course his theories on the modern city, consumerism, and consciousness in his work on the arcades of Paris and on such writers as Baudelaire apply much more to the nineteenth and twentieth centuries than to the eighteenth. However this is highly appropriate since, as we have noted, the great nineteenth- and twentieth-century cafés around Europe were often on main thoroughfares. At the center of Benjamin’s analysis are the strollers/sightseers (the flâneurs) who use these pedestrian streets and arcades to escape their domestic lives and explore the ever-changing life of the city. Benjamin hardly mentions café life even though he was a habitué and used them as a reading space when he was living in Paris during the 1930s. Perception, consumption, and alienation rather than social interaction, sociability, and cultural creation are at the heart of Benjamin’s analysis. Nevertheless a fine, recent, sociological analysis of Parisian cafés has tried to incorporate Benjamin’s theories into contemporary café life. Sadly this richly detailed study does not deal with literary and artistic cafés. However Ahearn’s chapter in this volume illuminates one of the key Baudelaire poems dealing with the demolition of working-class neighborhoods in the center of the city to make way not only for fashionable new apartment buildings but also luxurious cafés. Another paradox is that bohemians often move into poor neighborhoods, refashion them with their aesthetic sensibility, and wind up attracting the very bourgeois that they were fleeing from, whose entry into the neighborhood often drive up rents and force the less fortunate bohemians to gentrify some other neighborhood. Although these books are essential, their coverage of the creative liminal ambivalence between the bohemian passion for creativity and individuality and the bourgeois desire for wealth and stability does not result in a full analysis of the spatial dynamics of café life. At the seemingly opposite pole are works that focus on the role of solitude in creativity. Classics in this field run from Virginia Woolf’s foundational work of feminism, A Room of One’s Own, to Gaston Bachelard’s classic Poetics of Space. While Woolf of course calls for women to gain the space and the income necessary to be writers—that is to have the chance to be “Shakespeare’s sister”—the phenomenologist Bachelard focuses on the role of the home in inspiring the daydreams and reveries that are at the heart of the poetic sensibility. This paradigm brings up the central question of the gendering of the public sphere and café life. In the last 25 years both gender spatial theory and phenomenology have extended the study of creativity from the home to the café. The sociologist Monique Membrado, in her Poétique des cafés (1989), provided a tantalizing start to this process. Here she draws on the work of Sartre, de Beauvoir, and other novelists—and some phenomenologists such as Maurice Merleau-Ponty and Pierre Sansot (who contributed the preface). She provides some excellent insights into the environment of the café: what it feels like to wait for a person in a café or feel the gaze of strangers on oneself; the dynamics of the space and the play of light and the dialogue between inside and outside; the nature of time in the café, the nature of “being there.” Membrado concludes that the café is a place to dream—the same conclusion that Bachelard made about the home but without the full richness of his analysis. Unfortunately Membrado has not continued to build on her promising initial work on the café. Stefano Giannini, in his chapter “The Writer’s Provincial Muse: Piero Chiara in the Coffeehouse,” provides nuanced detail to complement Membrado’s more general analysis. Huguette Bouchardeau, in her superb biography of Nathalie Sarraute, relates how this pioneer of the “new novel” both found a “room of one’s own” for her writing and was able to find much of the solitude and detachment from the cares of daily life by writing in a café. At the end of the 1930s the Sarraute family moved to an apartment in the Auteuil neighborhood of the bourgeois 16th arrondissement of Paris, around Henri Pothiers square. Nathalie, a lawyer (as was her husband), rented a maid’s room on rue de la Tombe Issoire in the 14th arrondissement, where she had grown up and went a few days each week to write. Bouchardeau devotes a section of her biography to the question of writing in a café. Sarraute needed to create a daily ritual of writing: in the immediate post-war period she passed several hours each morning in a café—elsewhere she called it a bistrot. Bouchardeau notes this was a solitary practice for Sarraute, but then incorrectly asserts that Jean-Paul Sartre and Simone de Beauvoir did not write in cafés but instead spent their time at the Flore or Deux Magots as in a salon in the very chic Saint-Germain-des-Prés. Bouchardeau ignores the fact that Sartre and de Beauvoir often worked and wrote side by side and preferred, when socializing in cafés, to do so tête-à-tête rather than discoursing in a large group. Bouchardeau goes on to say that Sarraute chose very “ordinary” cafés in Paris. One of them was frequented by Lebanese people speaking in Arabic and another was a suburban café in Vétheuil near the family’s country home in the nearby suburb of Chérence. When the journalist Arnaud Rykner asked her why she wrote in cafés Sarraute responded that by doing so she avoided the temptations that face any writer at home—doing some chore such as answering the doorbell or telephone or reading a letter rather than facing the agony of a blank white page. The best remedy against such agony is the presence of people; and their talking, their conversations, do not bother her because the subject matter of their discussions are not her concern. A café’s customers might be noisy but “your cocoon of interior silence as a writer protects you from such distraction.” We shall see that Sartre felt the same way. One Day Lord happened to see Giacometti in a cafe. And indeed, miserable was what he did seem to be. This, I thought, was the true Giacometti, sitting alone at the back of a cafe, oblivious to the admiration and recognition of the world, staring into a void from which no solace could come, tormented by the hopeless dichotomy of his ideal yet condemned by that helplessness to struggle as long as he lived to try to overcome it. What a consolation was it that the newspapers of many countries spoke of him, that museums everywhere exhibited his works, that people he would never know knew and admired him. None at all. As in the case of Sarraute, Giacometti was able to be in the café and not be disturbed. In my study of working-class cafés in nineteenth-century Paris I found that generally customers tried not to disturb one another, and I coined the term “intimate anonymity” to describe this live-and-let-live attitude. This “etiquette” allowed Giacometti to express what Lord believes to be the “true Giacometti.” Perhaps after this café respite the great sculptor felt restored and achieved work closer to his ideal. Benoît Lecoq surveys the various cafés across the period—from the Enlightenment to the events of May 1968—and concludes that if Montparnasse was regarded during the interwar years as “the great university of the world” and its cafés welcomed and facilitated the interaction of the world’s avant-gardes, the celebrity that the famous cafés gained came with the loss of both their authenticity and their artistic clientele. The cafés wound up being “deserted fields of battle” which then entered into legend. He concludes that if tourism sometimes corrupts that subject upon which it gazes, it nevertheless perpetuates its memory. Famous Paris literary cafés in particular have gained a second life after the actors have disappeared and the effervescence fallen away. They have become miraculous witnesses of a time past, and become places of pilgrimage that one visits like a museum with the secret hope of finding something of the lost time. But rather than focus on why literary and artistic cafés have declined, I wish to end this introduction by suggesting that the famous intellectual cafés of Europe and the thousands ofothers that have often been used for this purpose should not be viewed as museums for tourists. As Ellis observes, “As many commentators have noted, the coffeehouse had provided many websites with a powerful metaphor for all kinds of collaborative intellectual enterprise.” The shift to a digital, fully open, and global market place ensures that labor and capital flow freely and quickly to sites of maximum productivity and profitability. Each space and each person increasingly has to be special, unique, and creative in order to prosper in a highly competitive world. The future belongs to those who stand out, who carve out a niche. As this imperative has grown, the traditional working class in the developed world has been giving way to what Richard Florida calls the “creative class.” But Florida goes further with a deeply democratic vision: “I should interject here that perhaps the single most overlooked—and single most important—element of my theory is the idea that every human being is creative.” Scholars of play and creativity, such as Stuart Brown, place the same emphasis on marketability. Small and large companies increasingly consult scholars like Brown on how to become more creative and competitive. Florida goes on to assert that creative people need and want creative environments in which to live, work, and play. (Most of this creative class see these three spheres of life as overlapping; what they hate is commuting.) Florida sums up the skills and inclinations of this class with “3 Ts”: technology, talent, and tolerance. To measure the degree of competitiveness of cities and regions in these areas Florida has developed both a “gay” and a “bohemian index.” These are based on the notion that any city that scores well in terms of nurturing these sorts of environments will attract the creative class in part because the cities have a wide variety of amenities such as museums, art galleries, cafés, bars, parks, bicycle and hiking trails, etc. Another notion Florida follows is the concept of “hip consumerism,” which draws heavily on the work of Jane Jacobs, the American urbanist who stressed the role of street and neighborhood sociability in making an area safer, more stimulating, and more creative. Often in such neighborhoods “new functions are found for old buildings” and the residents—by interweaving work, sociability, and family life—enrich their environment by facilitating spontaneous encounters. One huge building around a central atrium designed to encourage random encounters. Despite being a denizen of the digital world, or maybe because he knew all too well its isolating potential, Jobs was a strong believer in face-to-face meetings. “There’s a temptation in our networked age to think that ideas can be developed by email and iChat,” he said. “That’s crazy. Creativity comes from spontaneous meetings, from random discussions. You run into someone, you ask what they’re doing, you say ‘wow,’ and soon you’re cooking up all sorts of ideas.” So he had the Pixar building designed to promote encounters and unplanned collaborations. “If a building doesn’t encourage that, you’ll lose a lot of innovation and the magic that’s sparked by serendipity,” he said. “So we designed the building to make people get out of their offices and mingle in the central atrium with people they might not otherwise see.” The front doors and main stairs and corridors all led to the atrium, the cafe and the mailboxes were there, the conference rooms had windows that looked out onto it, and the six-hundred-seat theatre and two similar screening rooms all spilled into it. “Steve’s theory worked from day one,” Lassiter recalled. Perhaps he knew, as neuroscientists have shown, that 90 percent of communication is non-verbal. Thus this volume—focusing on the specificity and singularities of particular writers and artists in specific cafés—explores a subject that has not only a rich history but also a bright future as an essential cog in the new global economy. In the new global, networked, digitized world almost everyone will be forced to become creative. The ambiance of the traditional European intellectual café, rooted in the earlier ones in the Islamic world, will be an essential element because it speaks to basic human needs, as we saw at the start of this introduction. The following chapters delve deeply into how environments shape and reflect human creativity. This volume is part of a larger shift that seeks to explore the material basis of intellectual life. Moving beyond the social history ideas, looking at the circulation of political and cultural trends and fashions, the study of writers and artists in cafés allows scholars to examine in greater detail and logical depth the relationship between writers and their environments—in particular the spaces, rituals, and sociabilities that are key in the creation of culture. In short, an ecology of the thinking subject. Thus, in a world where the pace of change and innovation is accelerating at the speed of the fastest computers, the ability to be creative, playful, and sociable in order to be ahead of the competition is imperative: with an ability to create new ideas, forge new networks, and deliver new products companies, cities, and nations will fall behind. Ironically a world that is becoming all the more serious and ferocious in its competition also has need for the ability to dream and play and fantasize in cafés, as artists and intellectuals have for hundreds of years. This is why intellectual cafés and the functions they serve will never become obsolete: as long as human beings have bodies cafés are not destined, as perhaps are most stores, to become museums. Part One: “The Thinking Space: The Café as a Cultural Institution in Paris, Italy and Vienna” (Excerpt, Part One) published on A Woman’s Paris®. Harold B. Segel, The Viennese Coffeehouse Wits, 1890–1938 (West Lafayette: Purdue University Press, 1993). A similar study could be done based upon the gossip and humor columns of Parisian newspapers and probably also for Spain, Italy, and Britain. Segel is a specialist in Slavic languages and comparative literature who has also produced the book Turn-of-the-Century Cabaret: Berlin, Munich, Paris, Barcelona, Vienna, Krakow, Saint Petersburg, Moscow, and Zurich (New York: Columbia University Press, 1987). Segel, Viennese Coffeehouse Wits, 29–35. Charles Vincent Calvert in his The French Newspaper: Its Character, Style, and Contents (London: Thomas Nelson, 1928), xiii noted that short anecdotal pieces concerning daily life—often under rubrics such as echoes or notules—were a specialty of French journalism and were widely copied in Latin America. Ray Oldenburg, The Great Good Place: Cafes, Coffee Shops, Bookstores, Bars, Hair Salons, and Other Hangouts at the Heart of a Community (1989; Cambridge, MA: Da Capo Press; 3rd edition, 1999) and his more recent edited volume, Celebrating the Third Place: Inspiring Stories about the “Great Good Places” at the Heart of Our Communities (Cambridge, MA: Da Capo Press, 2002). Other important overviews which highlight the evolution of the field include: Robert B. Bechtel and Arza Churchman, eds, Handbook of Environmental Psychology (New York/Chichester: Wiley, 2002); Paul A. Bell, Thomas Greene, Jeffrey Fisher, and Andrew S. Baum, Environmental Psychology 5th edition (London: Psychology Press, 2005); and R. Gifford, Environmental Psychology: Principles and Practice 4th edition (Colville, WA: Optimal Books, 2007). The relationship between environment and the contemporary study of the brain is summarized in John P. Eberhard, ed., Brain Landscape: The Coexistence of Neuroscience and Architecture (New York: Oxford University Press, 2008). An important study of the impact of space on psychology is Esther M. Sternberg, Healing Spaces: The Science of Place and Well-Being (Cambridge, MA: Belknap Press of Harvard University Press, 2010). Some of the most important journals include: Environment and Behavior, Journal of Environment Psychology, Environment and Behavior, and Environment Psychology and Non-Verbal Behavior. Jürgen Habermas, The Structural Transformation of the Public Sphere: An Inquiry into a Category of Bourgeois Society (1962; Cambridge: MIT Press, 1991). Ellis shows how Habermas’s theory grew out of the work of Hans Speier’s essay “Historical Development of Public Opinion,” American Journal of Sociology 55 (4), January 1950, 376–88. The above citation quoted in Ellis (p. 222) is from this article. Ellis also notes Habermas’s use of a German text: Hermann Westerfrölke, Englische Kaffeehäuser als Sammelpunkte der literarischen Welt im Zeitalter von Dryden und Addison (Jenna: Frommann, 1924) along with Robinson’s Early History of the Coffee-Houses cited above. Craig Calhoun, ed., Habermas and the Public Sphere (Cambridge, MA: The MIT Press, 1993); Nick Crossley and John Michael Roberts, eds, After Habermas: New Perspectives on the Public Sphere (Oxford: Blackwell, 2004); Oskar Negt and Alexander Kluge, Public Sphere and Experience: Toward an Analysis of the Bourgeois and Proletarian Public Sphere (Minneapolis: University of Minnesota Press, 1993). For example, T.C.W. Blanning, The Culture of Power and the Power of Culture: Old Regime Europe (1669–1789) (Oxford: Oxford University Press, 2001) and James Van Horn Melton, The Rise of the Public in Enlightenment Europe (Cambridge: Cambridge University Press, 2001). Benoît Lecoq, “Le Café,” in Pierre Nora, ed., Les Lieux de mémoire (Paris: Gallimard, 1992), vol. 3, 878; Rethinking France: Les Lieux de mémoire, trans. Mary Trouille, trans. directed by David P. Jordan (Chicago: University of Chicago Press, 2001). Robert Darnton, The Literary Underground of the Old Regime (Cambridge, MA: Harvard University Press, 1985) contains a superb essay on the French “Grub Street” journalists and their use of cafés. Robert Darnton, Poetry and the Police: Communication Networks in Eighteenth-Century Paris (Cambridge, MA: Belknap Press of Harvard University Press, 2010). See Walter Benjamin, The Arcades Project, ed. Rolf Tiedemann and Howard Eiland, trans. Kevin McLaughlin (Cambridge, MA: Belknap Press of Harvard University Press, 2002) for a construction of the unfinished project based upon Benjamin’s copious notes. See Susan Buck-Morss, The Dialectics of Seeing: Walter Benjamin and the Arcades Project (Cambridge MA: MIT Press, 1991) for a penetrating study of the unfinished project and a metaphysical meditation on the nature of evanescence of modern life. Monique Eleb and Jean-Charles Depaule, Paris société de Cafés (Paris: L’imprimeur, 2005). In covering the contemporary capital they make some astute historical reference to the previous 50 years but not to the evolution of intellectual life in cafés. However the notion of “a room of one’s own” has become a general interpretive framework, as we see from Sharon Sloan Fiffer and Steve Fiffer, eds, Home: American Writers Remember Rooms of their Own (New York: Vintage, 1996). One of the best studies in this genre is Diana Fuss’s The Sense of an Interior: Four Writers and the Rooms that Shaped Them (New York: Routledge, 2004). In this literature solitude is seen as the key to creativity because it provides uninterrupted time to think for oneself. Marguerite Duras is often quoted as remarking on how solitude itself could be a kind of writing. In such a context the bed is often seen as a haven or bathtubs as ideal places in which to read. In this “spatial model of the self” rugs, paintings, mirrors, objets d’art, and photographs become “props” that both reflect and stimulate thought in the rooms of such luminaries as Emily Dickinson, Sigmund Freud, Helen Keller, Marcel Proust, or Mary Sarton. In these analyses, Virginia Woolf’s assertion that rooms were symbols of consciousness and furniture text springs to life. Indeed one scholar has compared Proust’s stylistic transformation of the novel to Haussmann’s architectural transformation of Paris. A wide range of questions deriving from this spatial and psychological shift which have been explored in the study of domestic creative spaces can also be asked about cafés. Cannot cafés be more than “an address,” indeed a “state of mind”? Do not cafés provide the broad view along with access to food, drink, and rest that our human ancestors searched for on the savannas of Africa? (Note that Jack London compared them to the fireside chats of hunter-gatherers.) But do not cafés also provide both “introverted” and extroverted” types of space, and thus bridge the divide between public and private lives? If windows in houses can function as “panoptic centers” in which conversations on the street can be overheard, cannot the same be said of café windows? Emily Dickinson seems to have been inspired by the street conversations she overheard. How often was this the case with writers in cafés? Cannot café life “shelter and shape the imagination” as much as home life? An examination of the homes of Helen Keller leads us to ask to what degree do our “lower” senses (touch and smell) fashion interiority? Note here the role of shaking hands in cafés or the role of smells in the creation of ambiance. As for Freud’s office, do paintings, rugs, posters, or mementos in cafés play the same role for the habitués that similar objects do in a home for its owner? Is not the collective effect of such objects to create a “theatre of composition not only in a domestic space but also in a public space,” with these objects becoming “props” for creativity? Cannot a café interior be as much a “pure figuration” or function “metaphorically” as much, though in different ways, as a home? If Freud could imagine the unconscious as a “bourgeois interior” cannot a similar analogy to various states of consciousness be found to correlate with the café? Cannot the sights, sounds, smells, and tastes of cafés be as evocative as Proust’s famous madeleine? Continuing with Freud, who took great care with his office—especially the “sight lines” that both he and his patients would have with the room—what role did the lines of sight between customers, proprietors, and waiters play in café life? Lecoq’s use of the term counter academy for eighteenth-century contestatory debate and discussion in cafés should be seen along with Darton’s depiction of French “Grub Street” politicians as forerunners of bohemia. See Lecoq, 870–72 and Robert Darnton, “The High Enlightenment and the Low-Life of Literature,” in The Literary Underground of the Old Regime (London: Harvard University Press, 1982), 1–40. César Graña, Bohemian Versus Bourgeois (New York: Basic Books, 1964; Steve Bradshaw, Café Society: Bohemian Life from Swift to Bob Dylan (London: Weidenfeld & Nicolson, 1978); Peter Stallybrass and Allon White, The Politics and Poetics of Transgression (Ithaca: Cornell University Press, 1986); Jerrold Seigel, Bohemian Paris: Culture, Politics, and the Boundaries of Bourgeois Life, 1830–1930 (1986; Baltimore: Johns Hopkins University Press, 1999). On the question of the café, gender, and the public sphere see Johanna Meehan, ed., Feminists Read Habermas: Gendering the Subject of Discourse (London and New York: Routledge, 1995); Brian Cowan “What Was Masculine about the Public Sphere?” History Workshop Journal 51 (2001), 127–57; Markman Ellis “The Coffee Women, The Spectator, and the Public Sphere in the Early-Eighteenth Century,” in Women, Writing and the Public Sphere, 1700–1830, ed. Elizabeth Eger et al. (Cambridge: Cambridge University Press, 2001), 27–52 Allis also cites Emma Clery “Women, Publicity and the Coffee-House Myth,” Women: A Cultural Review 2, 2 (1991), 681 and Margaret C. Jacob, “The Mental Landscape of the Public Sphere: A European Perspective” Eighteenth-Century Studies 28, 1 (Autumn 1994), 95–113. Gaston Bachelard, The Poetics of Space, trans. Maria Jolas (Boston: Beacon Press, 1994); Monique Membrado, Poétique des cafés, preface Pierre Sansot (Paris: Publisud, 1989). Huguette Bouchardeau, Nathalie Sarraute, Grande Biographies series (Paris: Flammarion, 2003). Rollo May, The Courage to Create (New York: Norton, 1975), 83–4. Nora’s introduction, 14–15 and Lecoq, 878–9. Ellis, The Coffee House, xii. Professor Florida is head of the Martin Prosperity Institute at the Rotman School of Management, University of Toronto, and has been exploring the transformation of American cities into their post-industrial phase. Florida sees today the creative class as numbering 40 million workers—30 percent of the US workforce—and divides them into two broad categories: 1) a super-creative core totaling about 12 percent of American employment with occupations including scientists, engineers, computer designers, and researchers. He also includes artists and technicians in graphic design and the media; 2) professionals in the more traditional fields such as health, business, finance, law, and education, with members of traditional bohemia rounding out his category Richard Florida, Cities and the Creative Class (New York and London: Routledge, 2005), 69. Stuart Brown, with Christopher Vaughn, Play: How It Shapes the Brain, Opens the Imagination, and Invigorates the Soul (New York: Avery, 2010)—companies wishing to institute creativity 136–8; play key to creativity 134; play prepares for evolution 29; link brain size and play 33; imagination most powerful human ability 86. Walter Isaacson; Steve Jobs: The Exclusive Biography (London: Little, Brown, 2011), 430–31. David Brooks, The Social Animal: The Hidden Sources of Love, Character, and Achievement (New York: Random House, 2011), 12. W. Scott Haine teaches at the University of Maryland University College. Jeffrey H. Jackson is Associate Professor of History at Rhodes College in Memphis, TN. Leona Rittner, who died in 2010, was an independent scholar based in New York and published widely in French and Italian literature. Text copyright ©2015 The Thinking Space ed. Leona Rittner, W. Scott Haine, Jeffrey H. Jackson. All rights reserved. Leave a reply on "“The Thinking Space: The Café as a Cultural Institution in Paris, Italy and Vienna” (Excerpt, Part Two)"